RIO DE JANEIRO, BRAZIL – In 1969, only a few years after Gaston Lenôtre revolutionized the art of pastry making, Joe Dassin recorded the catchy French tune “Les Champs-Elysées,” ten years before pasty chef Dominique Guerin would make his first visit to Rio de Janeiro. Lenôtre’s spirit lives on at Boulangerie Guerin in Copacabana, photo by Nathan M. Walters. Though Dassin may best be remembered for his French covers of English tunes (“Les Champs-Elysées” is a cover of the English song “Waterloo Road”), Lenôtre will always be known as the chef that radically changed the art of pastry making. A tradition that Dominque, Lenôtre’s former student, continues on Rio’s Champs-Elysées, Avendia Nossa Senhora. 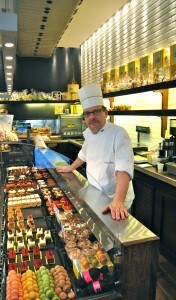 Boulangerie Guerin has only been operational for five months. However, the Guerin namesake has been aligned with pastry arts for almost a century, Dominique Guerin’s grandfather opened his bakery in the suburbs of Paris in 1921. It was here, during WWII, that Gaston Lenôtre began his training, laying the foundation for the culinary revolution the chef would later lead. A few decades later the Lenôtre-Guerin relationship would take another turn, when in the early seventies a young Dominique Guerin would begin his own training with Lenôtre. Guerin’s work with the master ultimately brought the young chef to Rio, for the opening of the Rio Palace (now Sofitel) in 1979. Thirty years have passed and in between Guerin worked in some of the finest restaurants around the world before returning to Copacabana – first as the pastry chef for Sofitel, now as the owner/operator of Boulangerie Guerin. The bakery is small with a spirited decor and is usually crowded – as word spreads Cariocas are traveling from far and wide to satisfy their craving for a proper French baguette and Guerin’s famous deserts (the tartelette aux fruits rouges, éclair au chocolat and millefeuille recently were awarded the best desert in Rio during Rio Gastronomia). 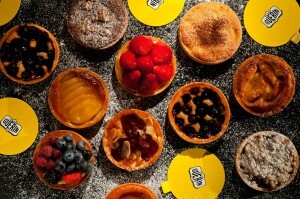 Guerin’s award-winning tartelettes, photo by Alexandre Landau. When asked about the decision to locate, what may at first seem like a delicacy reserved for Rio’s more well-to-do, in Copacabana, Guerin quickly cited price as the main deterrent from originally establishing in the city’s more sought after areas (e.g., Leblon, Ipanema). Boulangerie Guerin is a bit of an anomaly in Rio’s evolving culinary scene, offering visitors the chance to try true French delicacies without a significant investment. “There are many great, and many expensive restaurants in Rio now. For most, the good ones, it is a necessity, the cost of getting the proper ingredients is not cheap,” said Guerin. Fortunately for other neighborhoods, this taste of Paris that for the moment can only found in Copacabana, may soon be available in other parts of the city. The success of Guerin at the current Nossa Senhora location (what Guerin calls the Champs-Elysées of Copacabana) has lead to plans for expansion elsewhere in the city. For now, those craving something different and delicious must make the trip to Nossa Senhora. Best to put some Joe Dassin on the iPod and find your way to the little piece of Paris in Copacabana.